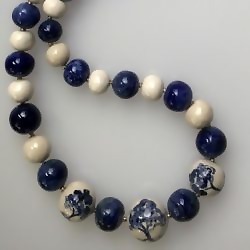 Ceramic beads. The beads are fashioned from earthenware clay and biscuit fired, they are then hand painted and glazed. This may be a pattern using natural mineral colours or a complete landscape painted on an individual bead. These are then fired again. A third firing is needed to add real gold or platinum or a lustre glaze detail. The toggle clasps are fashioned from sterling silver. Please select the options immediately above to edit profile.